It’s no secret that Nintendo Switch owners are hungry for some good ol’ retro gaming goodness to take with them on the go. And while we might still be awaiting Nintendo’s efforts, developer Hamster Corporation has been quickly working its way through the NeoGeo’s library whilst SEGA has promised to revisit some of its older classics in what they will call SEGA AGES. Then there’s Wild Guns Reloaded, a remaster of a cult 1996 SNES title developed by the same original team and even including a healthy dose of new features. It certainly sounds like all the right ingredients for the perfect retro remaster, but is Wild Guns Reloaded still as fun as it was twenty plus years ago? For those unfamiliar with Wild Guns, it’s a shooting gallery type game where you’ll blast away enemies in the background while you move and dodge their attacks in the foreground. Picture it similar to a light gun game only here you’ll need to pay attention to your character’s placement too. Each stage takes place over a couple of single-screen areas with waves of enemies thrown your way. This then ends with a challenging boss battle, which are arguably some the game’s highlights. The character you choose will offer basic movement left and right along the foreground as well as a dive and jump button. When it comes to your attacks, a lasso that stuns and limited explosives accompany your basic bullet-based weaponry. The controls take some getting used to especially as you need to focus on both what’s going on in the back and also near you. The Pro Controller feels the most comfortable when playing the game, however the Joy-Con function is great too making it ideal for some two-player action on the go. Wild Guns Reloaded includes the original two characters Clint and Annie who act as your all-rounders darting around fairly nimbly but restricting movement whilst shooting. Newcomer Dorris meanwhile focuses on explosives resulting in a character far more powerful but at the expense of mobility. The final character and perhaps my favourite is Bullet, a small dog that uses a floating drone to attack. What makes this particular character so brilliant is that you can lock on with the drone whilst moving Bullet around at the same time. All four are fun to use each with their own strengths and weaknesses. Developer Natsume hasn’t stopped there when it comes to new features adding a couple of new stages that play just as well if not better than its originals along with a boss rush mode and online leaderboards. Also included is the option to play the game not only with two players but also now up to four. Sure this makes the action on screen even more chaotic to follow, but it’s a fun chaos and something my friends and I had a blast attempting. Wild Guns Reloaded’s multiplayer works best in docked mode, the larger screen making it easier to decipher the game’s action. Handheld mode works just fine too, however I wouldn’t opt for more than two players on the Switch’s much smaller screen. The western setting alone would have been a perfect match for this type of game but the sci-fi elements injected in help craft an even more unique and varied world to tear through. You’ll battle in towns, saloons, canyons and mines whilst dispatching a mix of both human and machine-based enemies as you go. Sadly the game lacks a save option meaning you’ll need to reach the finale in one sitting with a limited number of credits. Lose too many lives and its back to the beginning for you. 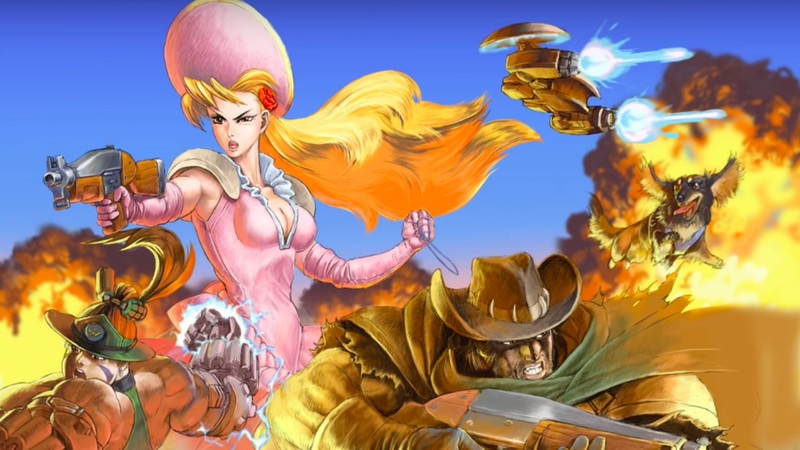 Wild Guns Reloaded isn’t exactly a long experience lining up with what you’d expect from any arcade-style experience, but rather the issue comes down to its difficulty. This game is very tough. So much so that it can be a little off-putting in the early goings especially as you’re adjusting to the unique shooting gallery style of gameplay. With bullets and explosives coming at you from all directions and one hit being all it takes for your character to keel over, death can and probably will come swiftly. Even after switching to the easiest difficulty I still found myself dying time and time again while adding more players to the mix isn’t the handy lifeline you’d expect either. Still, after learning the enemies’ attack patterns and getting a stronger hold on the gameplay I found myself not only advancing further but having a more rewarding and fun time in the process. Each boss that felt impossible before would seem trivial once I’d learned its tricks. This is very much a game that demands your time and certainly pays off for those that offer it. Wild Guns Reloaded, as excellent as it is, does have a higher than expected price tag attached to it. If it had been a little cheaper then I feel it would have been right in the sweet spot for pricing. As it stands the game is one of the more expensive offerings on the Nintendo eShop when it comes to digital titles, a fact many will likely pick up on. Wild Guns Reloaded is one of the best examples of bringing an older title over to a newer system. While it would have been one thing to do a simple port job of this SNES cult-classic, the wealth of fresh new content adds another layer to this already excellent shooting gallery experience. Steeper price aside, this is a perfect fit for Switch offering an action-packed, fun time on your own or with friends.